The Watershed Landscape Project has been awarded a Laureate in the European Union Prize for Cultural Heritage / Europa Nostra Awards 2013 (http://www.europanostra.org/laureates-2013/). The 30 winners, across four categories, were selected from nearly 200 nominated projects. The Watershed Landscape Project is the only UK winner in the ‘Education, Training and Awareness-raising’ category, placing the heritage of the South Pennines and the work of its volunteers firmly on the European stage. Of the 30 winning projects, six will be named as Grand Prix Laureates at the award ceremony in Athens and one of the winners will receive the Public Choice Award, based on an online poll conducted by Europa Nostra. Please register your vote for the Watershed Landscape Project by following this link (please note that you will be asked for three choices and can only vote for one UK Laureate). 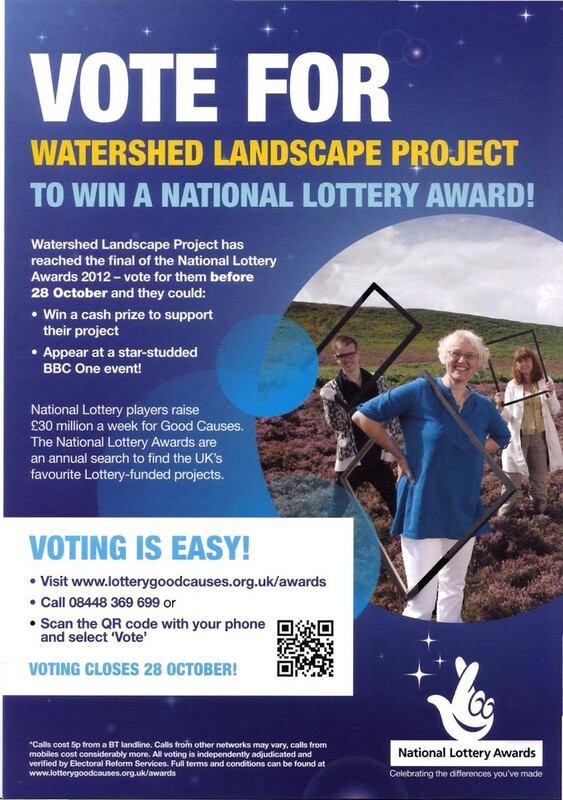 The Watershed Landscape Project has made it through to the National Lottery Awards (Environment Category). Thank you to everyone who voted in the last round – we now need your vote again! Click here to go to the Awards website and cast your vote for this great Project. 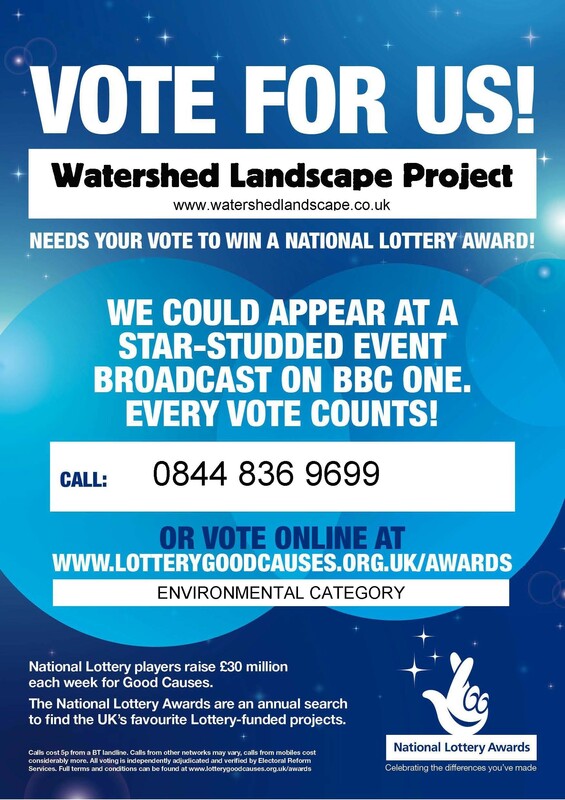 Watershed landscape Project reaches Semi-finals of the National Lottery Awards! Please vote for us and help us make it to the finals! Ilkley Moor can be an inhospitable place in January and February but this year the opening months of the year have been very different from the last two years. The fieldwork team lost only two of their nine scheduled working days but more than made up for it when on 23 February a record 17 panels were recorded in a single day despite it being cold and the cloud base almost at head height. True, Libby and Jo had to gently scrape frozen snow off a couple of panels one day and on another frozen grouse droppings clung to the panels like superglue making photography challenging – but it has been a good month. The last two working days were spent clearing up odds and ends, recording the last few panels in the third of the allocated sectors and mapping the archaeology of the Stead Crag cairnfield to get it done before the grouse nesting season. The unusually mild weather has confused the grouse. By early February they were already showing pre-nesting behaviour but a short spell off colder weather put a stop to that. The recording team didn’t stop though and on the morning of 1 March clocked up their 180th panel. On that beautiful and sunny day, recorders were sent out for just a morning’s work with the intention that most of the team would meet for lunch at the Cow and Calf at one. Richard and Tony M were allocated to the two Hawksworth Shaw panels. They found them soon enough but also found themselves in the Hawksworth Moor cairnfield. With masses of archaeology to map, they left site at half past four. A tired and very hungry Tony texted, “Fascinating archaeology BTW”. What dedication! Louise Brown, newly appointed Community Archaeologist replacing Gavin Edwards, met part of the team up at Lanshaw and came over to meet the team at the Cow and Calf – a big welcome to her. Richard is working on a new simpler 3-D imaging technique to help us catch up on the photogrammetry backlog. March sees moving to the other side of the moor to record Rivock and Rough Holden if Peter doesn’t grab the days for priority photogrammetry in the grouse breeding areas. No-one expected the project to have covered so much work by the end of February and the Watershed Landscapes team are hugely appreciative of the commitment shown by team members. After an extended seasonal break, Blue Team restarted work on the third week of January. With dodgy weather forecast for Wednesday and Thursday, a team of four turned out Tuesday on a dry, clear, cold and icy day with the advantage that the boggy moor was frozen and even the appalling ‘river of mud’ track left by the Emmerdale film crew was passable. Tony Morley rejoined the team after an absence and plans to be out once a week – welcome back to him. The Lanshaw Delves panels high up on the moor were tackled, the most distant of the panels to record on Ilkley Moor, and all five photogrammed and four of them fully recorded and photographed. A feature consisting of a small cairn & semi-circular possible rubble wall remains and a hut platform with some timber remains (probably 20thC), were mapped to the location plan as were the remains of 7 lime kilns (see below). It was sad to see the ancient Liberty boundary stone, “Lanshaw Lass” (carved with “ILB” in 1893 when the Ilkley Local Board bought Ilkley Moor from the Middleton family) still fallen and cast aside into a limestone extraction pit. Wednesday was cancelled. On Thursday, a quickly organised group of three went out in the afternoon to record and photograph the remaining Lanshaw Delves panel and went further S to find and record the panel reported near the Lanshaw Lad boundary stone. It was eventually found 60m from the reported position and the conclusion was, as Keith Boughey (PRAofWR) had suspected, that the reported ‘pecked’ dimples were entirely natural. They look to be root penetration of vegetation shortly after sediment deposition. The rock was measured, identification photos taken and the decision made to do neither a panel plan, location plan, photogrammetry nor comprehensive photography. On the way down, the weather closed in with horizontal hail and heavy rain. Horrible, but at least a full team doesn’t have to make the long trudge. The irrepressible Richard Stroud has also been in the field, not only helping out Red Team who is struggling to get enough volunteers out, but also to do Blue Team panoramas. The week before, Dave, Peter and Mike (who has been heard to say that ‘early industrial archaeology is far more interesting then Neolithic/EBA carved rocks’), did a recce visit and also reviewed the lime kiln remains on the S side of the Lanshaw Delves limestone boulder pits. Late 19th and early 20thC accounts record up to 12 kilns but they concluded a possible 7 and they are possibly of 17th or early 18thC origin – but an expert opinion is needed. Small finds of coal above kiln 1 show that they were coal fired. A lost path from the middle of the Delves to the W end of Green Crag was spotted on the 1850 map and this links to the possible ‘loading platform’ identified by Al Oswald of English Heritage during CSI training. Putting all these things together, it suggests a possible coal supply route from, perhaps, Baildon Moor and an onward lime supply route via the W of Green Crag to Ilkey. Brief notes of the visit were passed to Watershed Landscapes/Pennine Prospects and contact was made with Dr David Johnson, a geographer, landscape archaeologist, author and a limestone industries expert, who directed the Ingleborough Archaeology Group ‘Sow Kilns’ and other lime kiln excavations in the Dales. David has kindly sent a copy of the Sow Kilns report, photographs and other documents and plans a visit with us to Lanshaw Delves following which a report will be made to the Community Archaeologist. As far as we know, the Lanshaw kilns have never been properly investigated but some excavation of Lanshaw Delves was carried out in the 19thC. by a Mr Jon. Hainsworth who was looking for prehistoric huts. Alison Tymon of West Yorkshire Geology Trust, who some of you will know, passed on “A Sketch of the Pre-Historic Remains on Rombalds Moor”, Holmes, John 1886. That article is interesting not only for the carved panels and other archaeology it records but also that it records Lanshaw Delves. Holmes records that ‘in the memory of old people recently living’, oak and elm were, ‘often taken out of the bogs of Lanshaw and elsewhere’. (Lan-Shaw means ‘Long Copse’). He says that Lanshaw Delves “has always attracted notice” and records that, before it was recognised as a limestone extraction/ lime burning site, various people took it to be either a Roman Camp or British village and that a Mr Forrest interpreted the limestone boulder extraction pits and trenches as, “a double and sometimes a triple row of hut dwellings, upwards of a mile in length by about 40 yards in breadth…..”. Forrest interprets the lime kilns as the village bake-ovens: “which we conjecture these to have been, the common bakehouses of the community. There the game, whether wild boar or venison, was cooked, and the bread, if they had any, was baked ” ….. “when the savoury morsel was done to the bone, then the door was opened, the mea t withdrawn, and the feast at once begun..” and for drink “…water might be obtained from the springs above the swamp immediately in front.” Ah, early British life was wonderful and bountiful! The team are behind with photogrammetry with all the Green Crag Slack panels, several of the Green Crag panels, 5 Bingley Moor panels (and a few others) outstanding. Almost all of them fall within the ‘red line area’ – panels that have to be completed before grouse start pairing up in March. Whenever the panels are dry, a photogram team lead by either Peter or Dave will divert from the panels we are recording to photogram the red line panels. Outside of Wednesday/ Thursday, Peter or Dave will occasionally call a photogram day and make ad-hoc contact with you. Please help if you can. There are just 3 panels outstanding (apart from photogram) in the priority red line area and these are the 3 in the Backstone Beck Enclosure. Each has a panel plan so they can be done by a small team. After those, Blues will tackle the 15 panels along Pancake Ridge (the first escarpment above the road on Ilkley Moor E/Burley Moor W). Then its W to the Hangingstones three, four panels W of Backstone Beck and eight panels on Cranshaw Thorn Hill & Ilkley Crags. Workdays will normally be Wednesday and Thursday meeting 09.45 but, because of weather, subject to late-notice change. A good turnout is needed if the team is not to get behind. Jo Pinfield is rapidly regaining mobility and hopes to be out in the field and will gradually take over field supervision from Mike. Over the last few years (literally), advances in the field of computer vision and development of a technology referred to as ‘Structure from Motion’ has seen an explosion of online applications that enable users to create and explore 3D environments through imagery captured with their own digital cameras. Whilst many in the heritage sector, including universities, have dabbled in using and trialling the technology, no one seems to have grabbed it by the horns and adopted its usage on a medium – large scale project. CSI: Rombalds Moor aims to put this right, by embracing the panoramic and zooming capabilities of Microsoft’s Photosynth. This application was the first to bring the new technology to the masses when launched in August 2008, and still remains one of the best.